You like those Caramel Macchiatos? Well, hold on to your coffee cups, I've upped the ante and added booze! Take that and brew it, Starbucks! 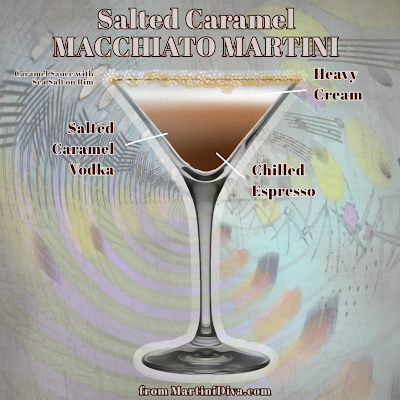 DIRECTIONS Dip the rim of your martini glass in some caramel syrup. Sprinkle a bit of the coarse sea salt onto the caramel (not too much, this is not a margarita), then chill your glass in the freezer. Fill a cocktail shaker with ice, pour in the Pinnacle Salted Caramel Vodka, chilled espresso, heavy cream, and vanilla extract then shake until well chilled. Pour into your chilled and rimmed glass. Dust with a little ground espresso beans, garnish with a cube of salted caramel candy and enjoy. National Macchiato Day is November 19th.